Having popped down to the Costa del Sol and Malaga's airport in Torremolinos no end of times to catch a flight or pick up family we realised never actually stayed there. So when a family birthday weekend occurred with members from the UK wanting nothing more than to step off the plane and unpack their bag it was obvious where our overnight stay would be. The family chose an apartment one line back from the beach, no parking, pedestrianised, shops and busy. I wanted a small, quiet hotel with parking outside town, a car park and small being my priorities, stars and beach not so important. Those are not as easy to find as you might think in one of the busiest and most popular towns on the southern Spains's Costa del Sol. I got to work. Planning is a huge part of my escapes and almost as much fun as the trip itself. It turned out that I didn't really have a lot of choice. Be in large, faceless chain hotels close to the others or a small, unique, independent hotel far away from the maddening crowd spots. I found it, 2*s, out-of -the-way with a car park, and stepped back in time too at the unusual Hotel Anos 50. 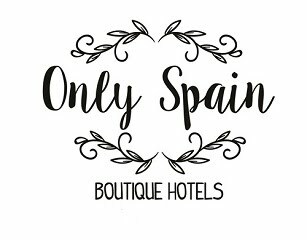 Not only a themed-boutique hotel with movie stars and décor of the 50s but quite amazingly very Spanish with only a smattering of English spoken, Spanish clientele and complete with a live singer on the Saturday night. Having been greeted by large, portraits of a young Elvis Presley, Gene Kelly and Marilyn Monroe amongst red and black flower wallpaper we were shown to our room down a corridor bedecked by more famous names. Our room, rather surprisingly as we were quite far back from the beach, had a sea-over-rooftops view. While our room wasn't large, nor too compact we discovered we did have a huge jacuzzi bath and being only two (hubby and I) found there was room for more. When presented with a large bath after an early start, longish drive and boozy lunch we chose to wallow rather than siesta. Well wallow and be bubble massaged and wallow some more. All too soon it was time to meet and eat with the family again and we chose a much needed twenty minute walk to join them on the promenade. Had we not been meeting family we'd have had cocktails at the hotel cocktail bar and dined in the charming restaurant and reminisced with music from yesteryear. Returning by taxi, I'm not sure we have found the hotel again on foot, our thought was to retire, we didn't need to partake of anything more but stepping into the bar we were seduced by its atmosphere and singer – it would have be rude to walk through and not have a night cap or two or sing along to songs of our youth. A hotel with a difference, it may have been glamorous in its day ( which wasn't the 50s) now it's a little worn but with lots of charm and is very close to the airport for a convenient late-night or early morning flight stop-over. For me it's miles away from the 'Costa del Sol' image and in every way was just the small, unique, independent spot I wanted for the night and I can say I've slept with many famous faces too. Check out price of Hotel Anos 50.